FEBRUARY 28th - Today's books are all updated - there are 70 free books to grab in this list! 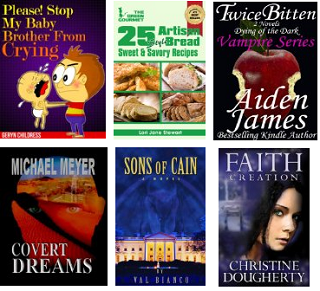 Plus all the free books on these lists that are still available - total 70 free books! You can read these free books on your iPhone, Android, Blackberry, PC, Mac, iPad or iPod Touch, or Android tablet - just grab a free Kindle Reading app. Or read them on your Kindle, Kindle PaperWhite, or Kindle Fire. Authors: Have your own free book(s) to add to this list? Fill out this form and it can be added! NOTE - If you're reading this message, you've probably got a smartphone, computer, iPad or tablet. LOVE this site, THANK YOU for all the wonderful things you do!!! Thank you for the free books! Love them! Thank you for taking the time to do this! You do a great service for readers!